HandBrake is a popular open-source video transcoder, integrated with many options, including cropping. By default, HandBrake will detect black bars and enable cropping automatically when ripping DVD, converting video, etc. Cutting off black bars can decrease encode time, the amount of disk space required, and offer a better visual experience. However, not all people need automatic cropping. Additionally, HandBrake automatic cropping sometimes works incorrectly. Many users report that it crops their videos improperly. So, they wonder how to disable HandBrake automatic cropping and how to crop videos with HandBrake manually. WinX DVD Ripper Platinum - The best HandBrake alternative which can rip ANY DVD including the encrypted to MP4, AVI, iDevice, Android, Sony, etc. You can disable or enable cropping, trimming, subtitles, etc with ease. As the sole DVD ripper supporting level-3 hardware acceleration, it can complete DVD ripping at super fast speed. How to Disable HandBrake Automatic Cropping and Keep Original Resolution? "Does anyone know how to stop 'Handbrake' from cropping my videos? I know it's just trying to help get a good picture quality but it has cut off part of the subtitles in One Piece, so I can't read the bottom half of every letter." "I have been using Handbrake for a while to compress video files recorded with FRAPs. I game/record at 1920x1080 and I have been using Handbrake to compress them but keep the same resolution. Now for some odd reason it is modifying the resolution to 1920x954. Needless to say, Handbrake is squishing the videos. I do not seem to be able to force Handbrake to save files at 1920x1080... Any way to fix this?" Sometimes HandBrake crops too much. Sometimes we don't need crop videos. So to keep our original video resolution, we need to disable HandBrake automatic cropping: go to "Dimensions" tab, navigate to "Cropping", choose "Custom", and then set the four crop values (Top, Bottom, Left, and Right) to "0". Then nothing needs to be changed. Simply leave "Anamorphic" on "Loose" and "Modulus" on "2". Now, hit "Start Encode" in the top toolbar to transcode video with original video resolution. How to Crop Videos Manually When Using HandBrake? Also, there're many times when we want to crop black bars off video. So how to make it? 1. Select "Custom" under "Cropping". 2. Set values for Top, Bottom, Left, Right respectively based on your own needs. 3. Hit "Preview" in the top toolbar to check if the output looks good. If there's something wrong, just change the values to make some adjustments. 4. Click "Start Encode" until the output looks fine. If you want to set both width and height, None is the choice. Many options in HandBrake are extremely difficult to understand for beginners. Moreover, some users complain that they can't force HandBrake to disable automatic cropping or save files at the resolution they set before, after trying possible fixes. Then, it is not bad to try a HandBrake alternative. If you want to rip DVDs with or without cropping, WinX DVD Ripper Platinum is a second-to-none choice. It is much easier to use than HandBrake. Even novice can communicate with it without help guide. It will never crop videos automatically. If you need to crop video, you just need to click "Edit" button, find "Crop & Expand" tab, tick "Enable Crop", choose a crop option from "Crop Original" drop-down list, or drag the lines in the preview screen to achieve the result you need. You get what you set. Moreover, it is superior to HandBrake in terms of supported DVDs, output profiles, editing options, DVD ripping speed and more. 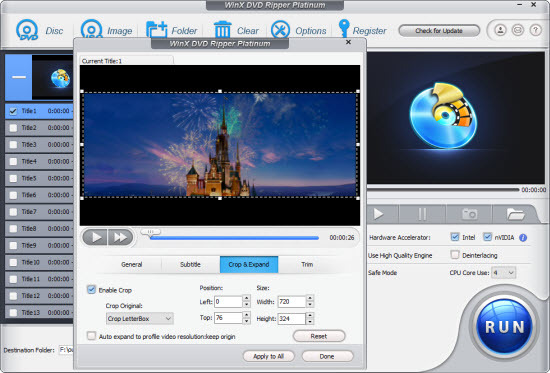 * This tool is not only designed for home-made DVDs, but also for commercial copy-protected DVDs from Disney, Paramount, etc. * It arrives with 350+ profiles for PC, Mac, phones, tablets, TVs, game consoles from various brands, as well as popular software and web services. * Besides cropping, you can also trim videos, merge multiple titles, add external subtitles, set video audio parameters, etc. * It is much faster than HandBrake and most competitors in the market, thanks to Intel QSV and NVIDIA CUDA/NVENC powered level-3 hardware acceleration, Super Encode Engine based on MMX- SSE & 3DNow! and Hyper-threading tech. Free download to have a try! User Guide | Mobile users go to this page. Donna Peng has been working as a copywriter in Digiarty Software for many years. She has written loads of articles to help people handle their DVDs, videos and other stuff. What is the best settings for HandBrake to convert DVD to MP4 for playing on Plex, Roku, iPhone, Android, etc? Here are the clearest and best HandBrake settings.. 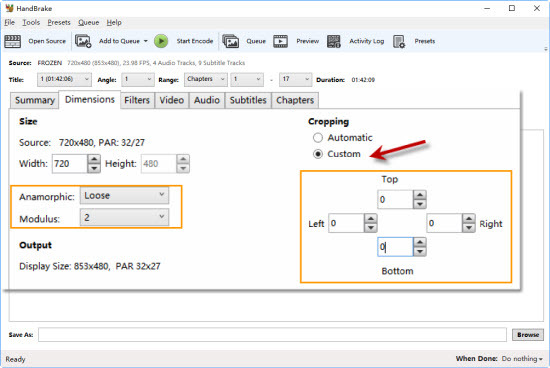 This HandBrake Subtitle tutorial teaches add soft or hard subtitle with HandBrake, watch the movie with language caption you need. This guide lets you know how to set HandBrake to get x265/H.265/HEVC encoded MKV/MP4 (UHD 4K/HD) video in minimum size and maximum quality. DVD Ripper: Rip & backup DVDs. 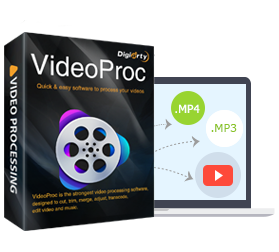 VideoProc: Convert, edit and process. MediaTrans: Transfer, manage iOS files.